Full color or black reproduction from your digital art or we can convert your printed graphics. Four color art is imaged onto a white aluminum plate or black imprint on a satin gold or silver plate. 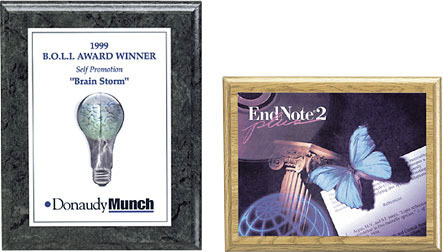 Choice of simulated plaque finishes in sizes from 5”x7” through 12”x15”. Personalization can be either direct or on a separate brass or aluminum plate with a secondary border plate in metal or slate textured laminate. Great for short runs, multi-color or color photos. No screen charges.